Published in 2002, limited edition London print sold out. 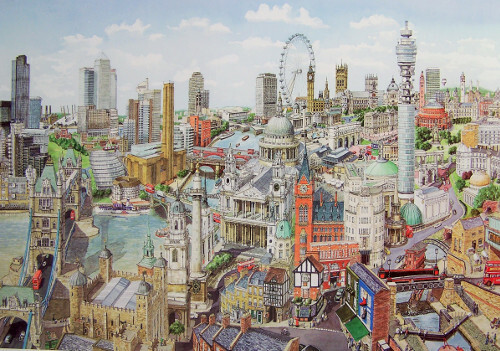 Limited Edition London print sold out. It was autumn 2001 and the last copies of 'London Millennium' were going out to the galleries. This London painting broke all records and sold out in 12 months. Although Edinburgh had just been published, the London galleries were starting to ask about the next London print; would there be another on the easel soon? This doesn't put any pressure on the artist! And there are other cities in the world to do. Anyway the decision was made in October and Stuart headed back to the Capital to see new buildings and visit corners of the city that he had not included in his previous London paintings. With a hundred or so more photographs to add to his collection, he set to work in November on London cityscape number four. One area of the picture shows his attraction to Camden with its canal details, and strange shop frontages; another part shows his determination to give St Paul's Cathedral, Christopher Wren's masterpiece, greater prominence than it had been allowed in his previous London paintings; also Tower Bridge deserved a complete view which he had not given it before. Tate Modern was now complete, the Millennium Bridge was going to be back in action — sometime, and The Greater London Authority building was well advanced. . . so all received close attention. Sometimes during a painting (around six months in gestation) something crops up that finds its way into the composition. This time the funeral of Queen Elizabeth the Queen Mother registered, although not in the foreground, whilst another lesser known figure — the father of a gallery owner who loved Stuart's London prints — passed away. He appears in the picture as a tribute to his enthusiasm for the 'London Millennium' and the way he sold one after the other of them to people in his home town. As usual Stuart's family and animals find their way into the composition, and self-consciously so does he. . . in the foreground! The decision to publish this London print as an edition of 1952 reflects the great interest in England during 2002 for the Queen's Golden Jubilee and it was felt an appropriate tribute.